Prop forward David Fifita has signed a new one-year deal that will keep him at Wakefield Trinity until the end of 2017. 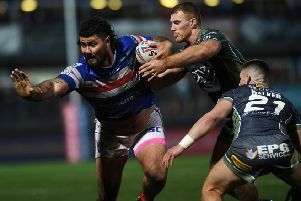 Fifita, 27, who joined Wakefield Trinity in June from NRL side Cronulla Sharks, has made 13 appearances for Trinity over the past five months, including the Ladbrokes Challenge Cup semi-final against Warrington Wolves. The Australian, who has represented Tonga, has scored two tries in his short spell at Wakefield. Head coach Chris Chester said: “I am delighted that David has agreed a new contract with us, especially as I know how much this means to the Wakefield supporters. “He is an important member of the squad who adds a lot of passion into the side with his big personality both on and off the field.